There is never a good time to lose your keys. Whether you are leaving work, walking out of your favorite store, finishing a hike, or heading to your vehicle after a long trip, losing your car keys can make your situation difficult. While you may be right outside your home when you lose your key, you suddenly become stranded. This can be an especially unfortunate situation if your house keys and car keys are lost at the same time, leaving you without anything you really need. When you find yourself in a situation like this, be sure to call 24/7 Emergency Locksmith at 484-891-1922. We offer emergency car key replacement services in the Allentown area, allowing you to get back to your day quickly and easily. Our locksmith experts can make car key replacements for most makes and models of vehicles. We also offer a variety of different key types to help you get what you need for your vehicle. Whichever key type you want for your replacement, we can make! We will come to you, make you a new key, and have you on your way in no time. Even if you have a spare key handy but lose one of them, you should get a new key made! You never know when you will lose it again and be left with no way to get into your vehicle. Our vans are fully equipped with the necessary tools to make you the keys you need for your vehicle. Whether you are in the middle of nowhere or right outside your Allentown home, we will come to you, cut you a replacement car key and send you on your way! When you are in desperate need of a replacement key, contact 24/7 Emergency Locksmith. 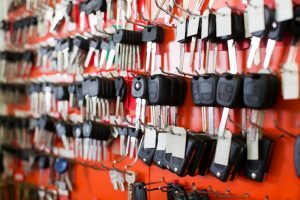 Our locksmiths can help you with our emergency car key replacement services!